and subscribe to our email list for the best deals! Has Spring Break snuck up on you? Looking for that last minute special? Wait no more and look no further! Book now using Promo Code: SPRING15 and get 15% off your reservation! Getaway to the beach this spring and enjoy our lovely sunsets and breezy afternoons. There's so much to do at the beach and memories just waiting to be made. Make plans to come dig and stay with us at Oyhut Bay Resort. Were offering a 10% discount on two or more nights around any dig dates. Our cottages are your perfect home base for diggers. 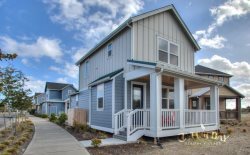 Each cottage has its own outdoor hot/cold water faucet, plus large, fully equipped kitchens so you can prep for frying, clam chowder or your favorite recipe. Our vacation rental homes fit from 1 to 8 friends and family members, enough room for the whole digging crew. And you can now get your license onsite at the Oyhut Bay Fresh Market. This is the perfect opportunity to spend a relaxing weekend at the beach. Fall weather is spectacular, beaches are less crowded and campfires may be permitted again for Fall Smores roasting. Check rates and availability online, then call to book your stay and dont forget to ask for your 10% off Clam Diggers Special!